As per usual, I cooked my way through the holidays this past year. From Thanksgiving through Christmas we had company at our home every weekend lasting about four days at at time. 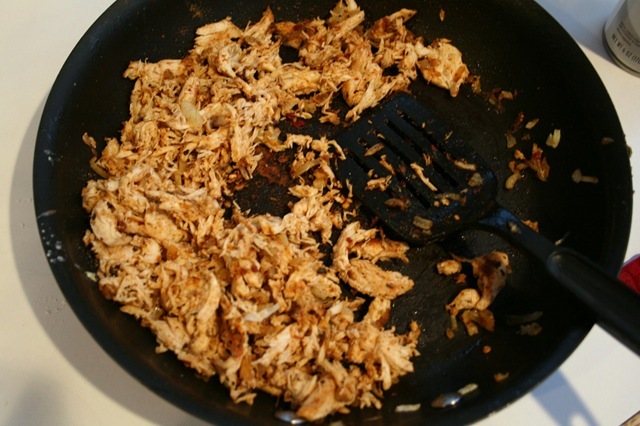 So, this meant lots of meals, snacks and… well, lots of cooking. Luckily I enjoy making food for a small crowd and I was also blessed with visits from several family members that are great in the kitchen and willing to jump right in to lend a hand. In between said visits, I also baked a bunch of treats and sent those across the country to land on the doorsteps of distant relatives reminding them that they were in our hearts and minds all year long. Let’s face it, no matter what is going on during the rush of the holidays, there is nothing like opening a small package bursting with cookies, brownies, slices of fruited breads, cheesy crackers and a few chocolates. Unfortunately, by the time Christmas actually rolled around I was pretty burnt out on baking any more sweets. I had planned to whip up some more cookies, breads and crackers to send off with our visiting family, but then I heard their tales of junk food consumption leading up to the big day and I realized we would just be overdoing it. I even purchased a couple of boxes of that Pillsbury pie crust that comes rolled up and ready to go. You know the one, it’s in the canned biscuit section of every grocery store and you could wrap it around mud, bake it and end up with a delicacy. I am serious…I LOVE this stuff. So, after all the turkey and pot roast was gone and my pie apples had been roasted in my new crock pot with the pork loin I decided I needed to do something with this crust before it had to be tossed. The first thing I made is my old standby, the chicken pot pie. And, as per the norm, it was delish! I was getting ready to make a second CPP to freeze when I thought, hhhmmmm…what other yummy meal could I make with these ingredients? That’s when I remembered briefly watching a cooking show where they made chicken empanadas and I thought I would try to pull it off. Next I rolled out the Pillsbury pastry to a very thin layer making sure not to roll back and forth to much. (For the non-regular bakers out there, rolling vigorously back and forth across pie pastry will compact the ingredients to the point that they do not rise up and puff at all. Thus creating a dense, hard lifeless pie crust.) I think the finished roll-out was about 1/8th inch thick. 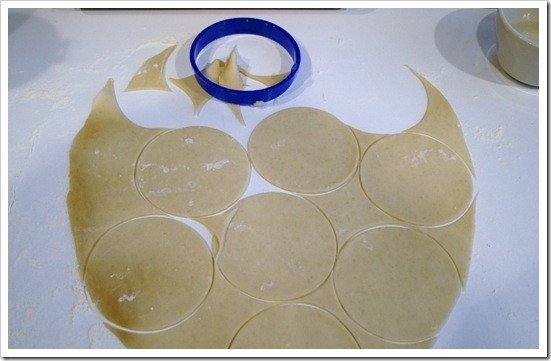 Then I took the largest circle cookie cutter that I have, which is about 3.5 to 4 inches across, and I cut out the empanada rounds. I managed to get 13 total rounds from just one of the two Pillsbury pastries. 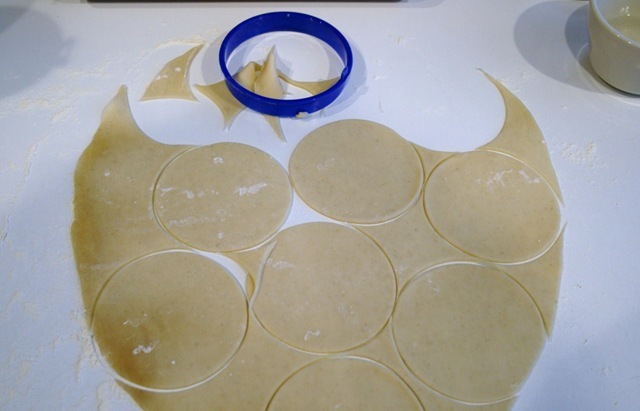 I did have to re-roll the extra pastry one time to cut out four more rounds and then I used the last little bit to make one round that was just a tiny bit bigger than the others. 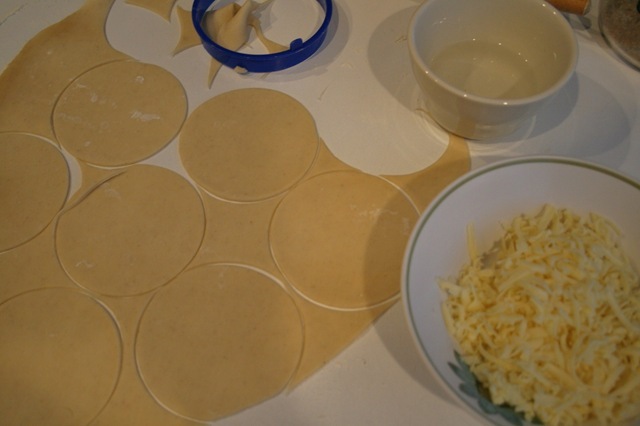 Once the rounds were all cut and ready to be stuffed I gathered up some Monterey Jack cheese that I had shredded and a little bowl of water. I took a round in one hand and stuffed a little bit (literally about a teaspoon) of cheese in the middle. 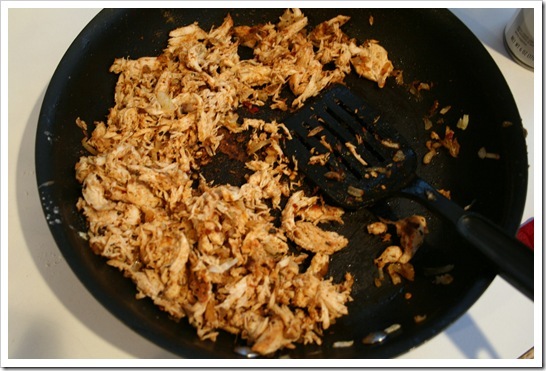 Then I scooped up some (about 1 to 1.5 tablespoons) of the seasoned chicken and onion mixture and placed it on top of the cheese. 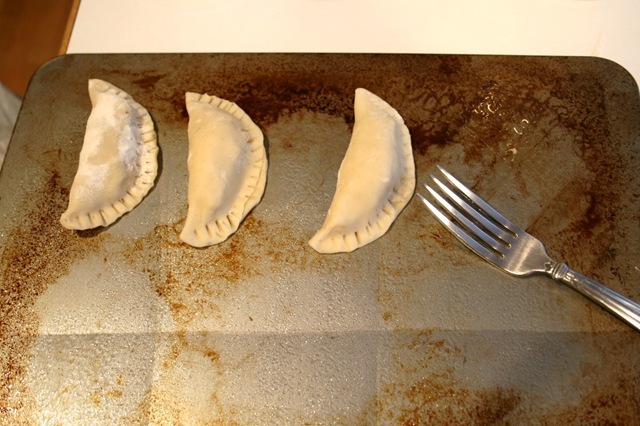 The next step was the tough one….wedging the filling into the pastry crust without tearing it. I learned that pressing the filling down a bit to compact it helped to fold the pastry around the filling with ease. In order to keep the crusts sealed I dabbed a finger into the bowl of water and ran a line of that around the circumference of the pastry round before folding it over onto itself. 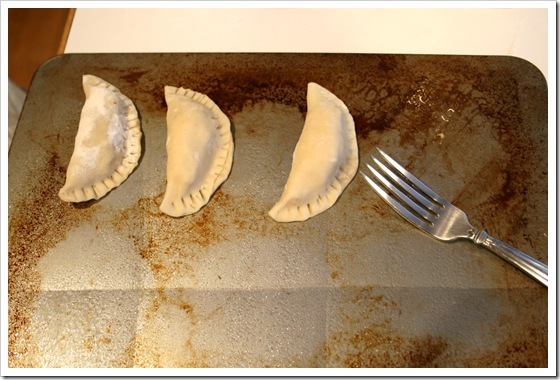 Just to be sure that the edges were completely sealed I crimped them by pressing down with the tines of a fork after laying them out on a lightly greased cookie sheet. The pie crust instructions actually do not say to use any grease, but I have learned in the past that a light coating of cooking spray never hurt anyone! Plus, my baking sheets are old a funky (from years of cooking spray-ha!) and they need a little lube up in order for the baked goods to come up with ease. You can see the one in the bottom right corner is the “little bit bigger” empanada, which I made from the last of the pastry. 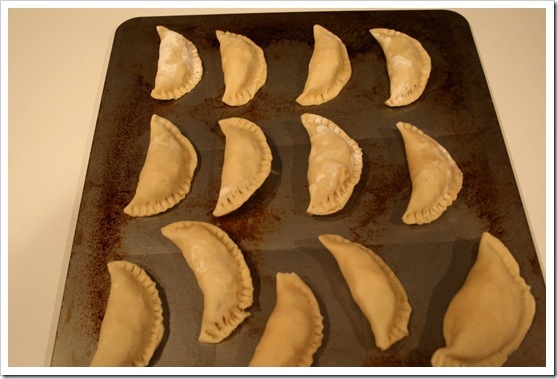 Once the pastry rounds were stuffed and the edges were sealed, I put them in a 400 degree oven for 15 minutes. 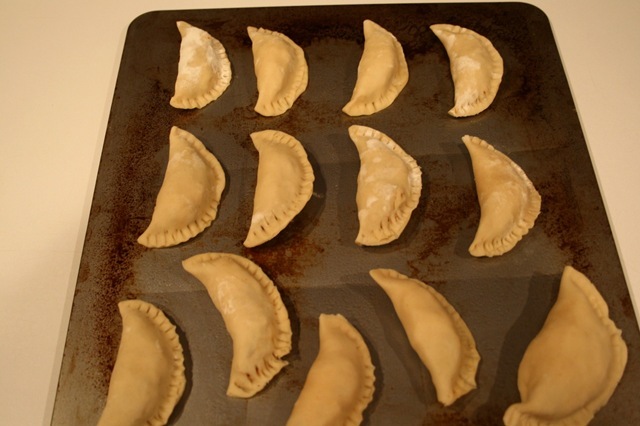 They puffed, crisped and browned up nicely during that time. A couple lost some of their cheese filling, but that just made for a nice addition of crunchy oven burned cheese- YUM! 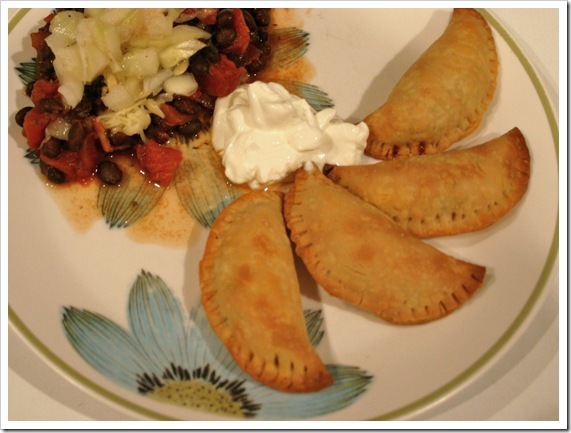 I served these with some black beans that I dressed up with cucumber and onion “salad” (I will have to tell you all about that combo in another post) and a dollop of sour cream. They ended up being really, really good and hard to stop eating. In fact, The Mister had a late meeting that night and I had to put everything away as soon as I was done because I kept hearing them call to me from the counter top. If it weren’t for the refrigerator door between us The Mister might not have had his chance at a bite! 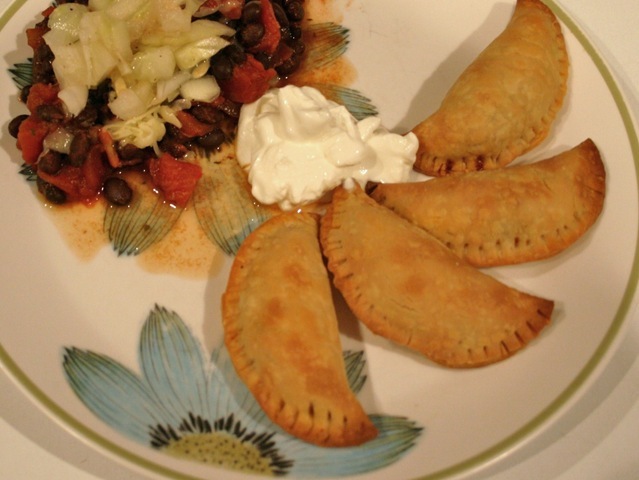 Give these super easy, Tex-Mex inspired pastry pockets of goodness a try. I don’t think you will be disappointed.